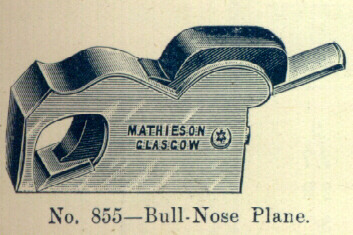 As the basis for our guide to Mathieson Planes we have used an original Mathieson Catalogue (click for illustration of cover). It is the 8th. edition, an impressive hard bound volume, with some 160 double pages. There is no date explicitly indicated, however reference is made on the title page to a Gold Medal, received in the 1886 Edinburgh Exhibition. Mathieson also received a Gold Medal in the Melbourne Exhibition of 1880, and Prize Medal at the London Exhibitions of 1851 and 1862. Alexr. 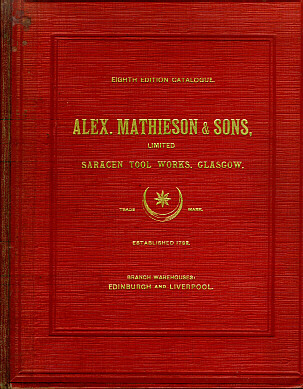 Mathieson & Sons Ltd were established in 1792. In order that the text can be read, and also in order to minimise download times, we have provided separate illustrations for each plane type, or group of types. Mathieson's note that 'the engravings, though generally representative, are not to be held as binding as to details'. 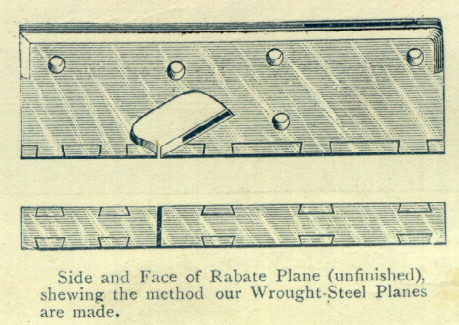 It is fortunate that Mathieson considered it useful to illustrate how their wrought steel planes were dovetailed together (click for illustration of the construction of a rabate plane). On an all-steel dovetailed plane it is often difficult to detect the dovetails - indeed some Spiers' Planes are stamped 'DOVETAILED' to ensure that the effort (and extra cost) involved did not go unnoticed. Click for illustration of Nos. 842, 843, 844. These Smoothers were available with 1 3/4", 2", 2 1/8" and 2 1/4" irons; Nos. 843 and 844 had the option of a closed handle. Click for original prices. No. 845 - Wrought Steel, Dovetailed, Fitted with Rosewood, Gun-Metal Lever (click for catalogue illustration). This Panel Plane was available in the following lengths - 11 1/2", 12 1/2", 13 1/2", 14 1/2", 15 1/2" and 16 1/2"; the standard iron was 2 1/2"; optionally 2 5/8" and 2 3/4" irons were available. The 11 1/2" to 13 1/2" lengths inclusive had flush ends, as the Panel Plane illustration; on the 14 1/2" to the 16 1/2" panel planes the sole projected at heel and toe, as the Jointing Plane illustration. Click for original prices. No. 846 - Wrought Steel, Dovetailed, Fitted with Rosewood, Gun-Metal Lever (click for catalogue illustration). This Jointing Plane was available in the following lengths - 20 1/2", 22 1/2", 24 1/2", and 26 1/2"; the standard iron was 2 1/2"; optionally 2 5/8" and 2 3/4" irons were available. Click for original prices. No. 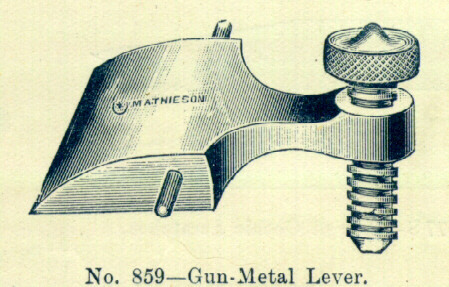 847 - Improved Mitre Plane - Wrought Steel, Dovetailed, Fitted with Rosewood, Gun-Metal Lever (click for catalogue illustration). No. 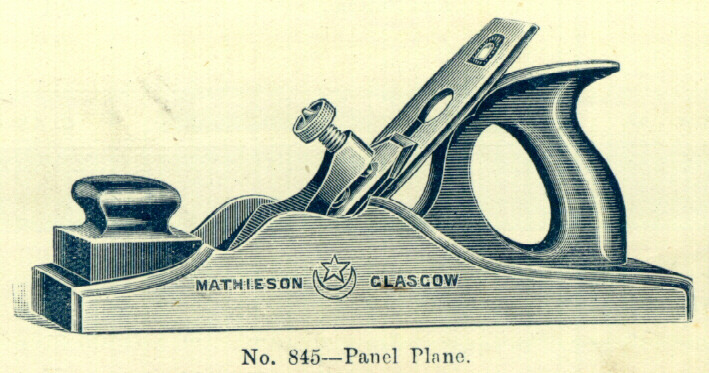 848 - Plain Mitre Plane - Wrought Steel, Dovetailed, Fitted with Rosewood, Gun-Metal Lever (click for catalogue illustration). Both the Improved and the Plain Mitre Plane were available in the following sizes - 8 1/2" x 2" or under, 10 1/2" x 2 1/4", 10 1/2" x 2 3/8", 10 1/2" x 2 1/2" (widths refer to iron width). Optionally any Mitre Plane was available with a skew mouth. Click for original prices. No. 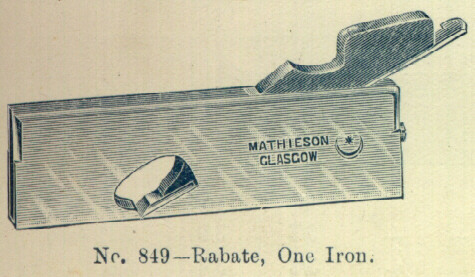 849 - One Iron, Square (i.e. not skew) Rabate Plane - Wrought Steel, Dovetailed, Fitted with Rosewood, with Wedge. No. 850 - One Iron, Skew Rabate Plane - Wrought Steel, Dovetailed, Fitted with Rosewood, with Wedge. No. 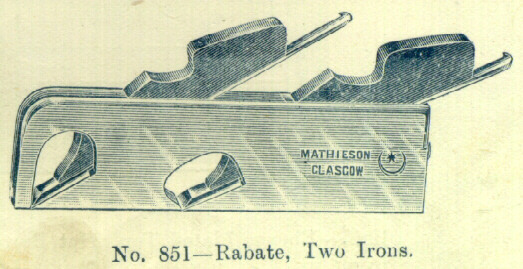 851 - Two Irons, Square (i.e. not skew) Rabate Plane - Wrought Steel, Dovetailed, Fitted with Rosewood, with Wedge. No. 852 - Two Irons, Skew Rabate Plane - Wrought Steel, Dovetailed, Fitted with Rosewood, with Wedge. Rabate Planes were available in the following sizes - 6" x 3/8", 6" x 1/2", 7" x 5/8", 8" x 3/4", 9" x 3/4", 9" x 7/8", 9" x 1", 9" x 1 1/8", 9" x 1 1/4", 9" x 1 1/2", 9" x 1 3/4". Click for original prices. No. 853 - Shoulder Planes, Wrought Steel, Dovetailed, Fitted with Rosewood, with Wedge. 8" long, were available in following widths - 1", 1 1/8", 1 1/4", 1 1/2". Click for catalogue illustration. No. 854 - Thumb Planes, Wrought Steel, Dovetailed, Fitted with Rosewood, with Gun-Metal Lever. 5" long, were available in following widths - 1", 1 1/8", 1 1/4". (Not illustrated). No. 855 - Bull-Nose Planes, Malleable, Cast Iron, with Rosewood Wedge were available in following widths - 1", 1 1/8", 1 1/4". No. 856 - Bull-Nose Planes, Gun-Metal, with Ebony Wedge were available in following widths - 1", 1 1/8", 1 1/4". Click for catalogue illustration. No. 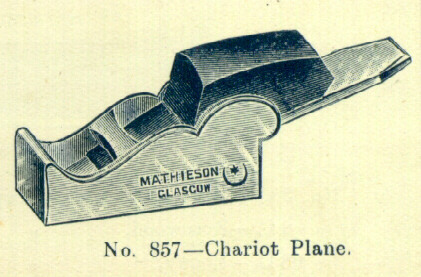 857 - Chariot Planes, Malleable, Cast Iron, with (Rosewood) Wedge were only available in 1 1/8" width. No. 858 - Chariot Planes, Gun-Metal, with (Ebony) Wedge were only available in 1 1/8" width. Click for catalogue illustration.